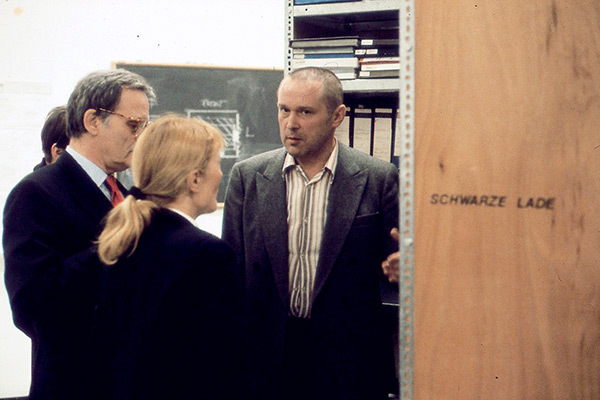 In 1981, around70 artists from West Germany and other European countries met in 1981 invited by the artists houses Stuttgart and Hamburg , represented by H. v. Wedel, C. Rieß, U. Bernhardt and B. Nieslony. The project title to this meeting was “THE COUNCIL”. Significant for this project were basic developments on artistic interaction, intervention, communication and inter-media arts. Presented and discussed were artistic and society-forming positions, scientific contemplations, as well as their consequences for performance art, installation, painting, video and various other media. Ideas on networking and connecting the media were specified with more precision. All participants present at the meeting that month in Stuttgart agreed not to document this conference through a catalogue or any other similar publication. Such a format would not have reflected the process-based, nomadic concepts, a unique style feature of this meeting – a process intended to be continued with the same flexibility in future. – underwent many transformations. The first one was a question of material: the heavy wooden wardrobe was replaced by light metal cabinets according to the collection’s constant growth. The next transformation became necessary around 1993, because the material was not just compiled from various meetings but also raised questions surpassing mere documentation. It evolved into archive structures, which require a different approach on structure and processing. These triggered in return a different approach on collecting. Projects such as “Die Gabe” (=“The gift”) “Current Affairs”, “the permanent performance art conference” and the “”Anthropognostisches Tafelgeschirr (=“anthro-prognostic tableware”) are aiming towards these extensions. One burning question evolved above all from this process: how does this archive generate knowledge, or to be more precise, how does THE BLACK KIT generate activities, art practices and theoretical insight? The Black Kit as Sculpture of Public Interest, Mousson 1992.